The results: Sanders 86 percent, Clinton 14 percent. More than just a landslide. An earthquake. America needs a revolution. And only Bernie Sanders, as President of the United States, can make one. I have passed 54 amendments on the Floor of the House in the last three years, more than any other Member. And when Bernie Sanders served in the House, in his time Bernie was the "Amendment King," getting so many good things done in a hopelessly waterlogged institution, again and again. I am the only Member of the U.S. House of Representatives who raised most of his campaign funds from small contributions of less than $200 (in both 2012 and 2014, by the way). Bernie Sanders is the only Member of the U.S. Senate who raised most of his campaign funds from small contributions of less than $200. And this year, Bernie Sanders is the only Presidential candidate who has raised most of his campaign funds from small contributions of less than $200. Bernie and I are not owned and beholden to the billionaires and the multinational corporations and the lobbyists and the special interests. Bernie Sanders is unbought and unbossed. So am I. That is an essential element of the political revolution. Bernie Sanders and I share a goal of building a grassroots movement of people who want to take back our country from the billionaires and the multinational corporations. We want to make elections into about something different: Not the lesser of two evils, but the greater good. But Bernie and I cannot accomplish this on our own. We need your help. We need to declare our Declaration of Independence from the baneful power of Big Money, by coming together one and all. This is the revolution you've been waiting for. The place is here, and the time is now. Power ... to the People. 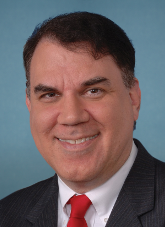 Rep. Alan Grayson of Florida is a Democratic candidate for U.S. Senate.